While Cosmopolitan Jewels always has beautiful jewelry suitable for any occasion, the company has expanded into a dedicated line for weddings. We want to provide our customers with special pieces to wear on their wedding day, and then of course keep and wear them on their anniversaries, special occasions, and for those normal days when you might just need a little extra sparkle. The jewelry, which features a mix of gemstones, Swarovski crystals, and pearls, offers an array of looks for today’s bride, who is often shunning traditional pearls and opting for something more memorable and unique. 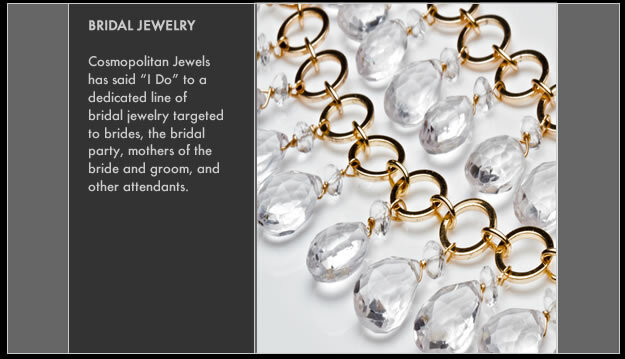 For brides that want their bridesmaids in color-coordinated dresses and accessories, Cosmopolitan Jewels can do that too, with an extensive variety of color collections that can be tailored to any bridal party's hues.